Your family will thank you for putting your wishes on paper. Here's how to get started. Here's a shocker: More than half of Americans don't have a will — including nearly a third of those 65 and older, according to a 2016 Gallup research poll.Footnote 1 One possible reason: "People don't like to plan for their own mortality," says Jean Kim-Wall, a director and wealth strategist at Merrill Lynch. But estate plans (which include wills) are less about your own future than they are about protecting your family — from discord, avoidable taxes and legal fees. Most important, a will gives you control. "If you don't have one, the state will decide how your estate is handled," says Kim-Wall. "Whether you're nearing retirement or just starting a family, it's a good idea to put your wishes down in writing," Kim-Wall adds. A good place to start is by assessing your net worth with the Merrill Edge Net Worth calculator. Then you'll want to consider your goals. "Think about how you want to pass on your legacy," she suggests. "An estate planning attorney can help you fine-tune your initial thoughts and make everything official by drafting the necessary documents." And bring your family into the conversation as well, to make sure they understand your wishes and how you'd like them carried out. Naming who inherits what from your estate is the first step. And while dividing up your financial assets is important, also think about whether you have any personal belongings that you'd like specific people to have. These may be heirlooms of sentimental value or a beloved collection. Don't forget that estate planning in a digital world means that you might have things like videos and photos on your personal computer or mobile phone that your family might like to have — so be sure to determine who will get access to your passwords. You'll also have to consider the ways in which your assets are passed on, whether it's directly to your heirs or via a trust. Any assets you leave directly to heirs can be used or spent at their discretion, whenever they choose. A trust, on the other hand, allows you to set rules for how and when any assets you leave might be disbursed. This is particularly useful if you're leaving assets to minors or to someone who is not able to manage their own finances, perhaps because of a disability. A will can always be updated as circumstances change, and it's far better to have a will that's suitable for your current situation than to have no will at all. If you have minor children, you'll also need to name a guardian or guardians — the person who would look after them if you and their other legal parent were both to die. Even though it's a remote possibility, you'll want to check with this person first, because it's an awesome responsibility. For a first-person account of why this is so important, read "The Things They Never Tell First-Time Parents." Wills can become outdated quickly, so try to make sure yours spells out how you want to account for major life events like births, deaths, marriages and divorces. But whatever you do, don't let the complexity of thinking through multiple hypothetical events discourage you from making a will in the first place. A will can always be updated as circumstances change, and it's far better to have a will that's suitable for your current situation than to have no will at all. "This is one circumstance where 'good enough' is not so bad, because it's still much better than having nothing in place," says Kim-Wall. You'll want to take a look at your will every few years anyway, to make sure it accurately reflects your wishes and the latest circumstances of your life. 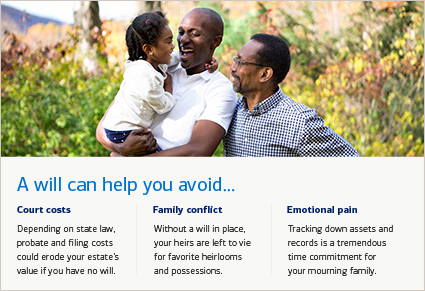 For more tips on getting started, check out "What You Need to Know About Your Will."